As a non-profit theater arts organization, we are committed to bringing you exceptional productions at a fraction of the cost you might pay in Boston or Providence. Gain Flexibility: While all sales are final, as a members, you can exchange tickets up to 48 hours prior to a performance to accommodate your schedule. Enjoy First Seating for Shows: If you’re here when the theater doors open (30 minutes prior to the show beginning), as a member you will be seated first, giving you your choice of seats! Add a family member’s name to your membership for no extra cost: Just pick the Family Membership option when purchasing your membership. Save on Educational Programs: Take 10% off all our adult and children classes. Take 10% off after-school programs and summer camp. Artist’s Will Save: Artists who are members save on fees and gallery commissions. Special Member Events: We invite you to enjoy special events just for our members. All these benefits are yours for just $50. Membership is good for one full year from the day you join. 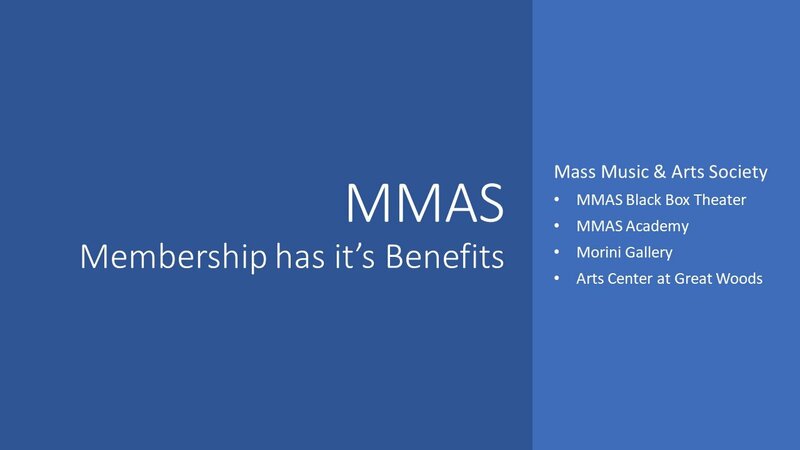 Member dues are vital to MMAS’s financial health. Give a Gift Membership: MMAS memberships make great gifts!